Finish The Story — Picture This | Oh Danny Boy! In response to Mondays Finish The Story. this is a flash fiction challenge where you will be provided with a new photo each week, and the first sentence of a story. Your challenge is to finish the story using 100-150 words, not including the sentence provided. The people waved at him from the bridge below. Actually he knew they were not really waving at him but at someone else. 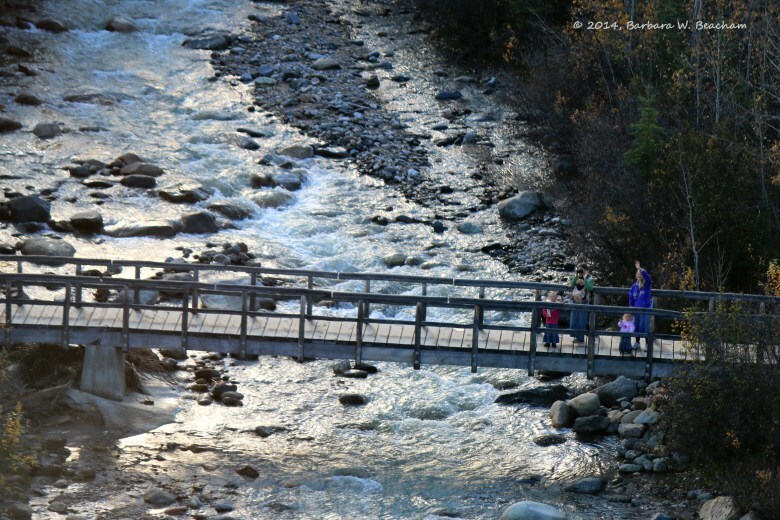 The lady with the camera and her little one in a harness on her chest was probably taking a picture of her husband who must be somewhere to his left high up here on the upper bridge above the fast flowing creek. The other mom and her little girl were also waving at someone who meant a lot to them. Very few people knew he even existed. He had no family or close friends. Just himself, and he didn’t like what he saw. No picture of him would be taken. He hated that the little girls would be witness to his final act. The water looked cold, the rocks looked sharp and hard. Perhaps if he yelled just before he jumped she could, if she was very quick, capture his last moments. She could even win a prize for her photo. He could live with that. This entry was posted in Monday Finish The Story and tagged Flash Fiction, Short Stories, Suicide, Writing by Danny James. Bookmark the permalink. Well done Danny, I enjoyed your story.